As reported in Deutsche Welle, the documents were presented yesterday at an unveiling ceremony in Santiago, Chile. The files were finally made public after a petition was filed earlier this year by Chilean deputies who demanded their release. The files will now stay on public display at Chile’s National Archives, and digital versions will be made available online. Indeed, the Nazis had some support in Chile and other Latin American countries during WWII, which is why so many Nazi officials fled to South America after the war. In 1941, after Nazi groups were discovered in the country, the Chilean government set up a special police unit called Department 50 to track these spy rings and thwart their activities. As the newly declassified docs show, upwards of 40 people among Nazi spy rings were arrested during the war. Department 50 managed to break up two major spy rings that were working in Chile and other South American countries, seizing weapons, confiscating thousands of dollars in cash, and uncovering various plots, including a plan to bomb mines in northern Chile. The special police force also learned that the children of some German families living in the country were undergoing paramilitary training. The files also show that Nazi spies and supporters in Chile managed to intercept radio communications made by the Chilean navy. Nazi agents were able to encrypt these messages, and relay them back to the Third Reich. It’s fairly obvious from this and other examples that the Nazis received considerable help from Chilean sympathisers in high places. Perhaps most shocking of all, Department 50 uncovered and thwarted a plot to attack the Panama Canal. “If they had prospered in their objectives, it could have changed not only Chile’s history, but the history of the whole world,” said Hector Espinoza, the director general of Chile’s investigations police, at yesterday’s ceremony. No details of the plot were made available, but the spies were likely thinking of planting bombs in vulnerable areas, rendering the canal inoperable for extended periods. Destroying one or several locks, for example, could have been potentially catastrophic. No doubt, the destruction of the Panama Canal, even temporarily, would have been a major disruption to the Allied cause. The canal served as a primary route for the transport of US troops and supplies from the US East Coast to the Pacific Theater. An obstructed canal would have greatly stunted the ability of US forces to fight Imperial Japan, which was allied with Germany at the time. 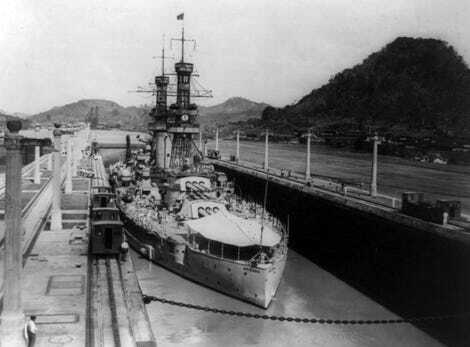 As a relevant aside, the Japanese had also formulated a plan to attack the Panama Canal during the war using a fleet of submarines, but the global conflagration ended before the attack could be launched.